Clickstreams are among the most popular data sources because Web servers automatically record each action and the Web log entries promise to add up to a comprehensive description of behaviors of users. 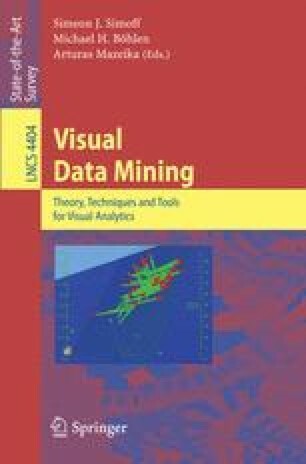 Clickstreams, however, are large and raise a number of unique challenges with respect to visual data mining. At the technical level the huge amount of data requires scalable solutions and limits the presentation to summary and model data. Equally challenging is the interpretation of the data at the conceptual level. Many analysis tools are able to produce different types of statistical charts. However, the step from statistical charts to comprehensive information about customer behavior is still largely unresolved. We propose a density surface based analysis of 3D data that uses state-of-the-art interaction techniques to explore the data at various granularities.